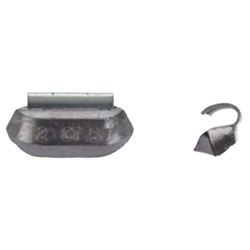 CT Type Lead Clip-on Wheel Weight Coated 12 oz BOWES WW CT-120 Box of 20. The CT-Series clip-on wheel weight is used on heavy-duty trucks with Firestone, Accuride, Budd, or Goodyear tubeless rims with straight flanges. Primarily used on rim widths of 6.75”, 7.50” and 8.25”. Please use rim gauge (RG2) to verify specific applications.